Doohoobe II | Irene Abdou Photography, LLC - Travel. Lifestyle. Documentary. NGOs, Development & Public Health. In the town of Djibo in northern Burkina Faso, young "doohoobe" (people who sing "doohaali") dance in traditional fashion. The men and women each form a line facing each other, rhythmically shuffling towards and then away from each other. The women clap their hands and sing as the men "dooho," or sing a distinct, deep rhythmic chant. The man in the purple turban plays a calabash (a form of drum), as the other men hold "cabbi," sticks which are used when herding cattle. 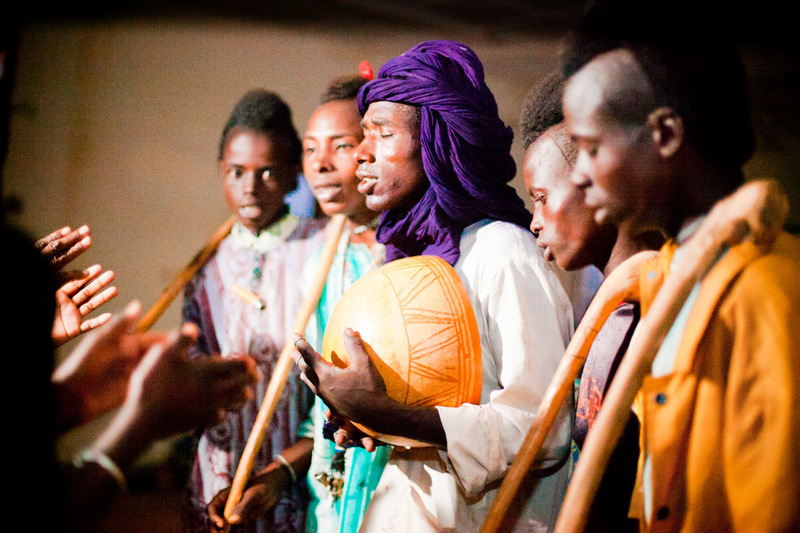 "Doohaali" is a distinct form of music practiced only by the Fulani in Djelgooji, a particular area of Burkina Faso. The young men in this image are the winners of a regional music and arts competition, going on to perform at Burkina Faso's 2010 "Semaine Nationale de la Culture" (SNC) in Bobo-Dioulasso. The women clapping at left are members of the community who have joined in the nighttime fun.